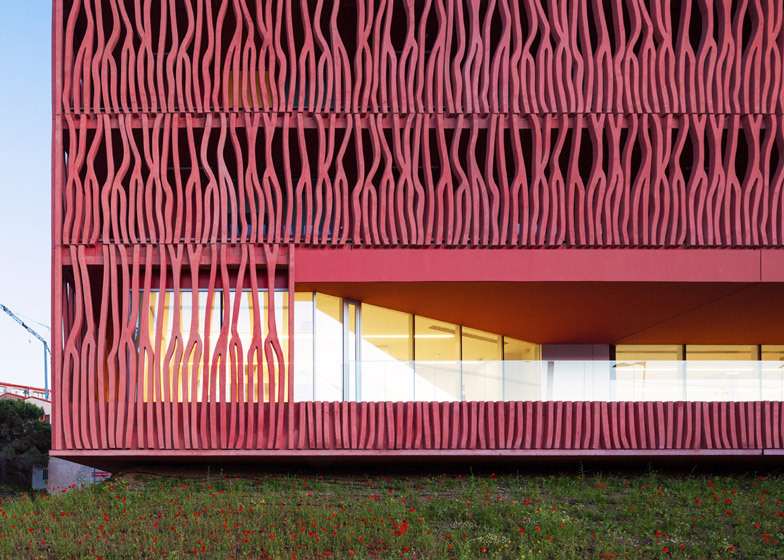 Anemone tentacles moving beneath the surface of the ocean influenced the latticed facade of this student housing block by French studio Atelier Fernandez & Serres at an oceanic observatory in the eastern Pyrénées (+ slideshow). 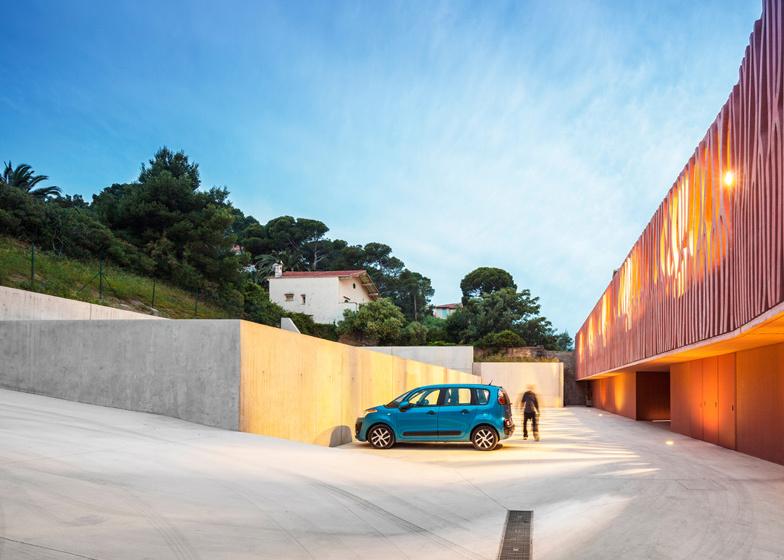 Atelier Fernandez & Serres designed the International Accommodation Centre for the Oceanological Observatory of Banyuls-sur-Mer, a coastal science facility that forms part of the Paris-based Université Pierre et Marie Curie. 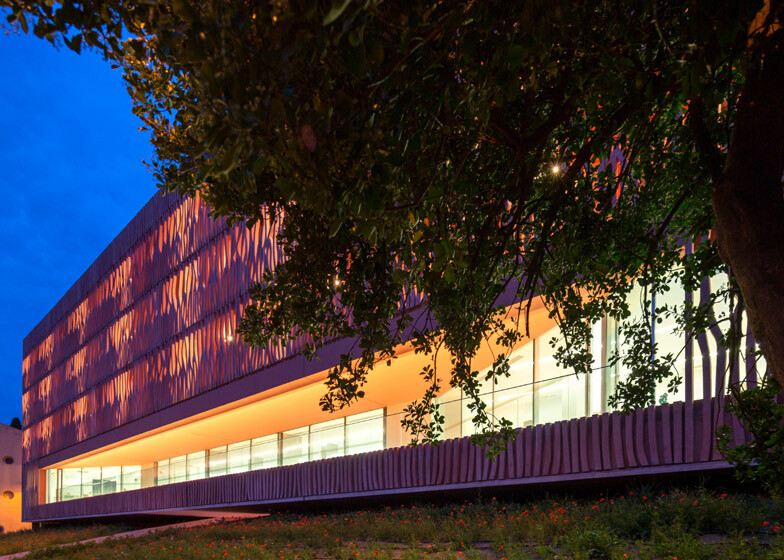 The six-storey building accommodates 74 short-term residences for travelling students and researchers, behind an ornate coral-pink concrete screen that conceals the interiors whilst allowing light and ventilation to pass through the building. Bedrooms are located on the four upper floors of the building. Corridors run lengthways around the edges, sandwiched between the rooms and the latticed facade. 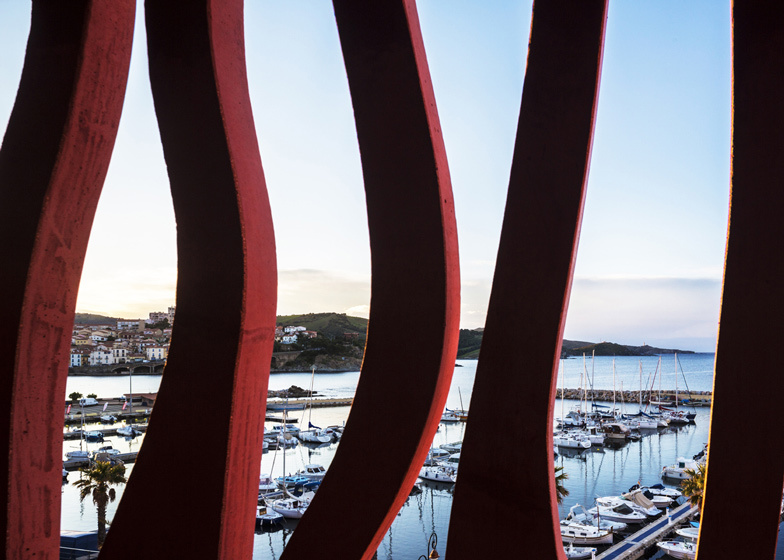 "The colourful concrete mesh is at the same time a balustrade and a visual filter to the sea," said the architects. "It provides a wall that guarantees the intimacy of users, bedrooms and walkways." Communal spaces and lounge areas occupy the two lower floors of the building. These include a canteen with a long strip window, which is the only interruption to the otherwise continuous facade. 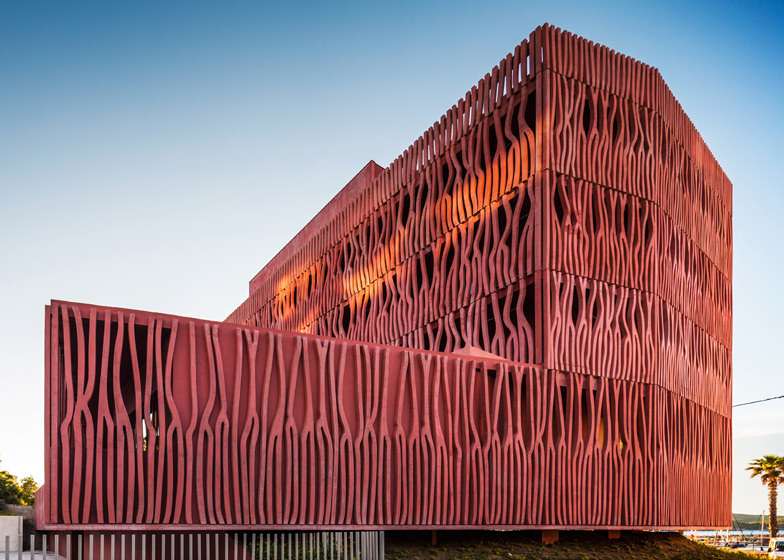 The architects cast the components of the facade onsite then arranged them in irregular patterns to recreate the appearance of coral tentacles. 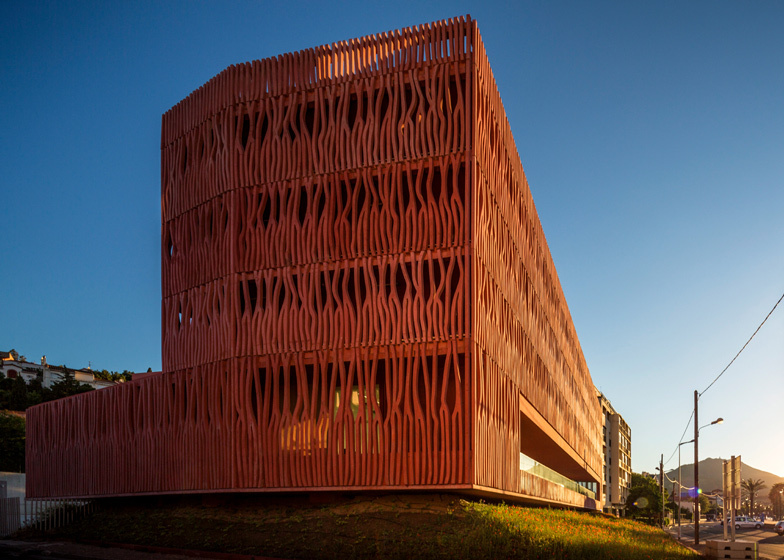 "We developed the facades using a limited amount of distinct shapes," they explained. "These strands were then assembled in modules according to a simple mathematical algorithm which creates a vibration in the shadows and the matter." 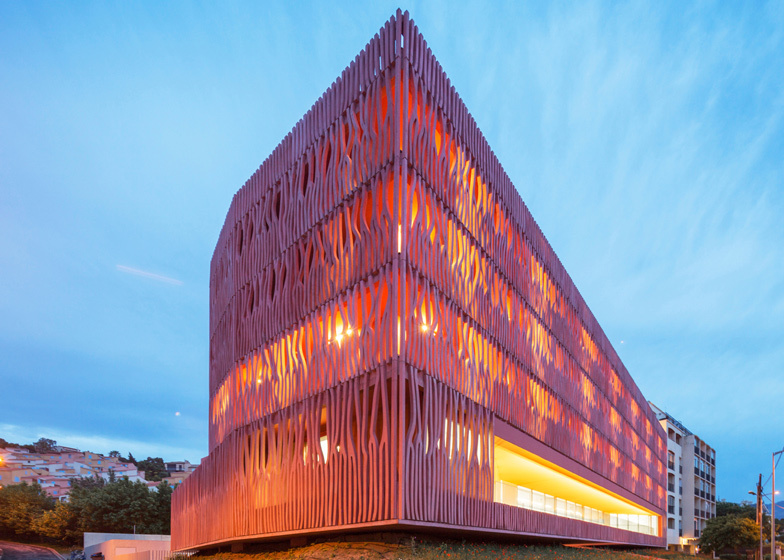 The building was one of 14 projects shortlisted for the AR+D Awards for Emerging Architecture 2013 last month. This project of an accommodation centre consists in a restaurant, working space for scientific research and seventy-four. 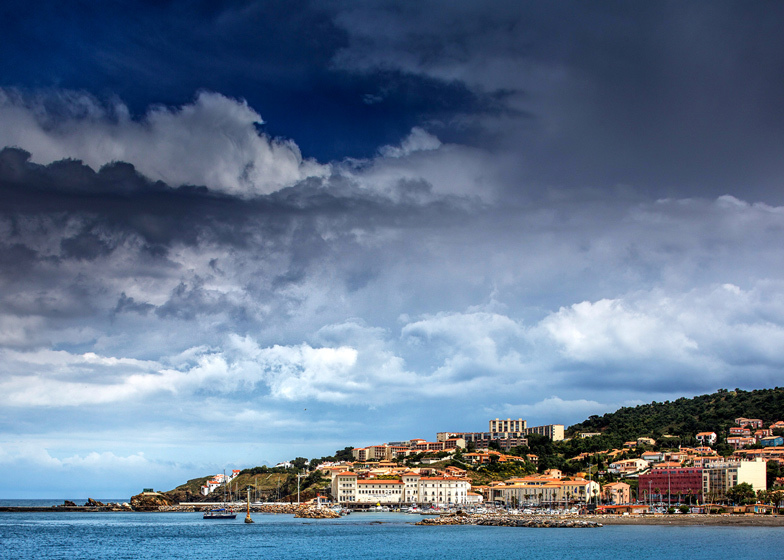 The building is part of a complex of facilities which include the oceanological research centre and observatory of Banyuls-sur-Mer, in France. 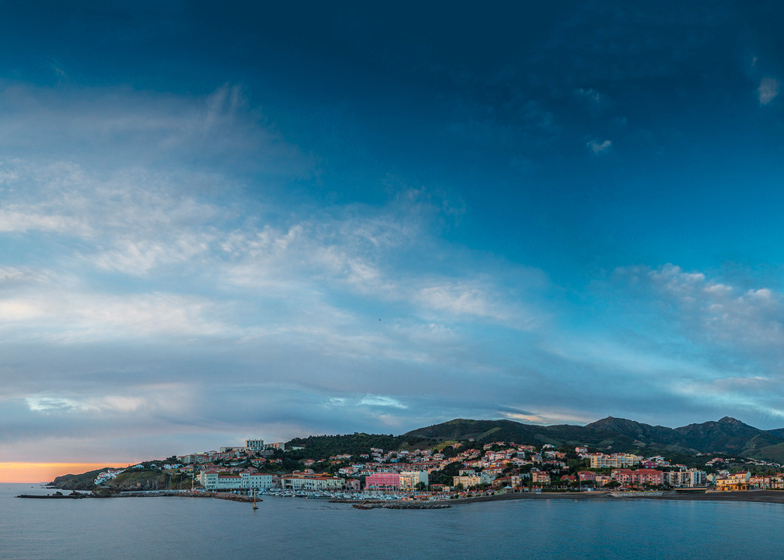 This observatory is located in the middle of the marine natural reserve of Cerbères-Banyuls, in the Pyrénées orientales department. 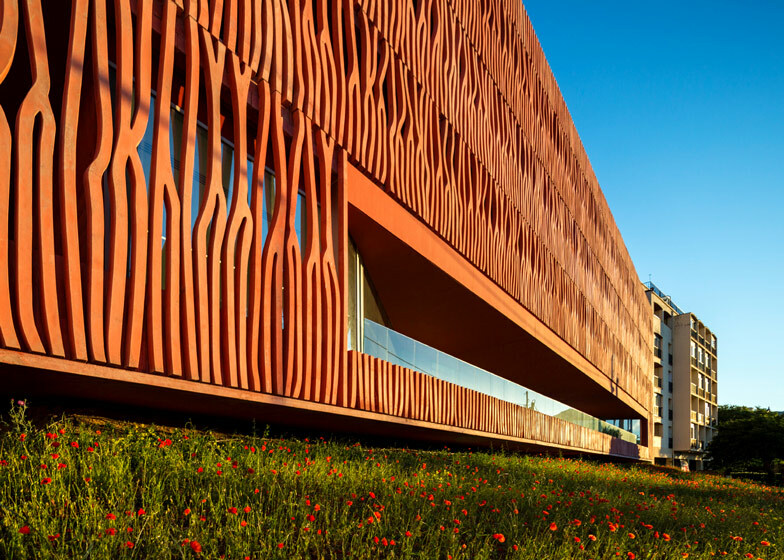 Its purpose, as a European scientific research and training centre, is to accommodate scientists and students from all over the world during short research and experimentation missions. The building is located on the seaside and continues along the existing topography, be it of the sky, the ground or the horizon. It reinvents the relationship between the view and the landscape, and accompanies the building height plan of the city. It reinvents the relationship between the view and the landscape, and accompanies the building height plan of the city. Its ochre tones reflect the surrounding hills and the nature of the soil that comprises the cultivated terraces of the hinterlands. These hills covered with vineyards tower above the sea and glint with the deep earthy hues of iron oxides. 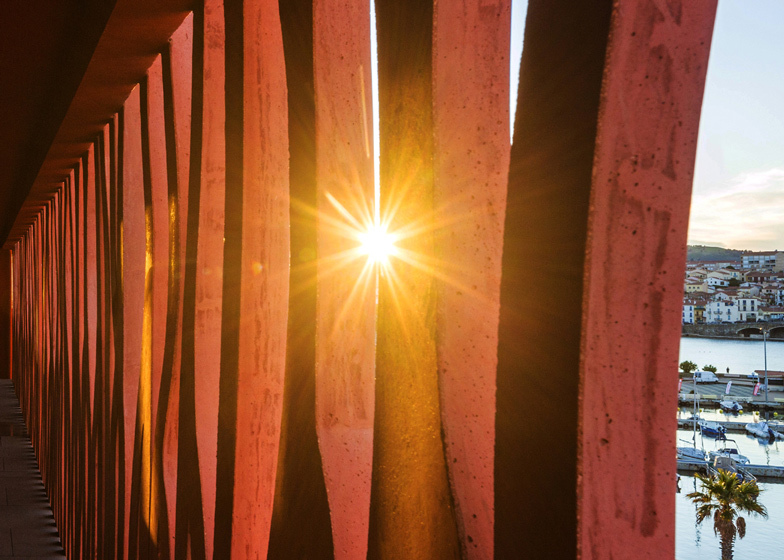 The project, a rectangular monolith entirely coated in a gown of pink-ochre coral, faces the marina. It also marks the limits of the shore and the city. 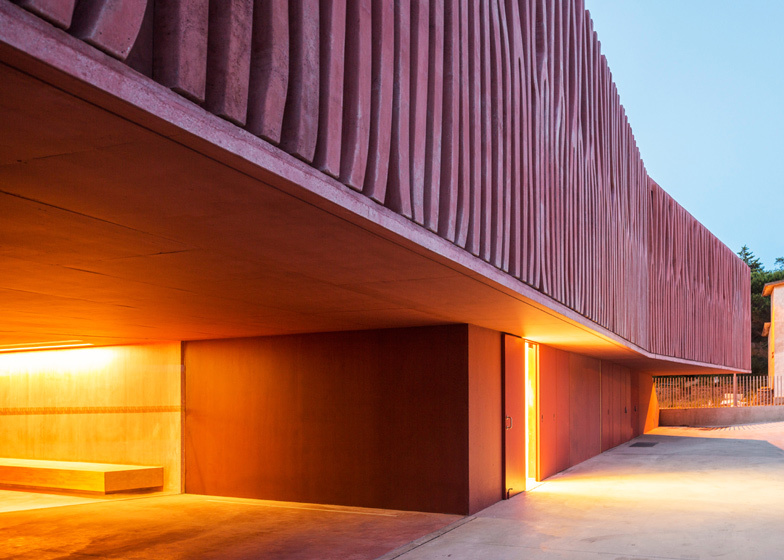 Behind this undulating envelope, access to the bedrooms is provided by large peripheral walkways that also serve as balconies for the accommodations. 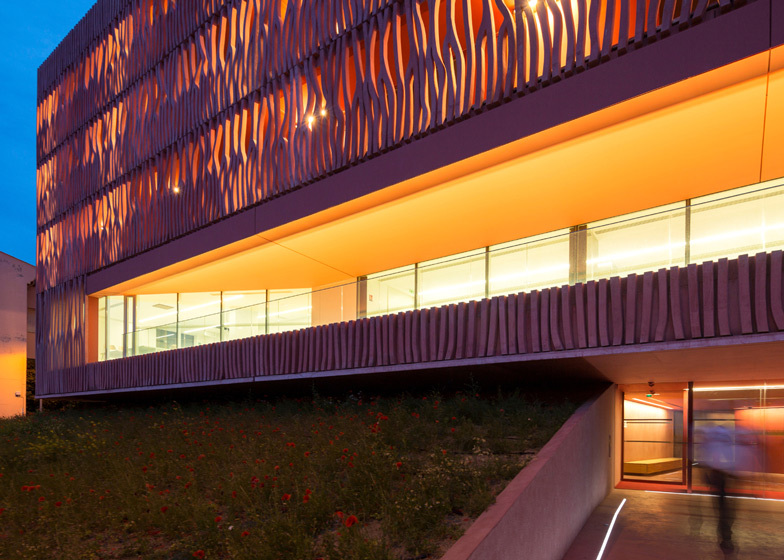 These walkways are covered with a self-consolidating concrete mesh inspired by a graphic, light and see-through coral design. 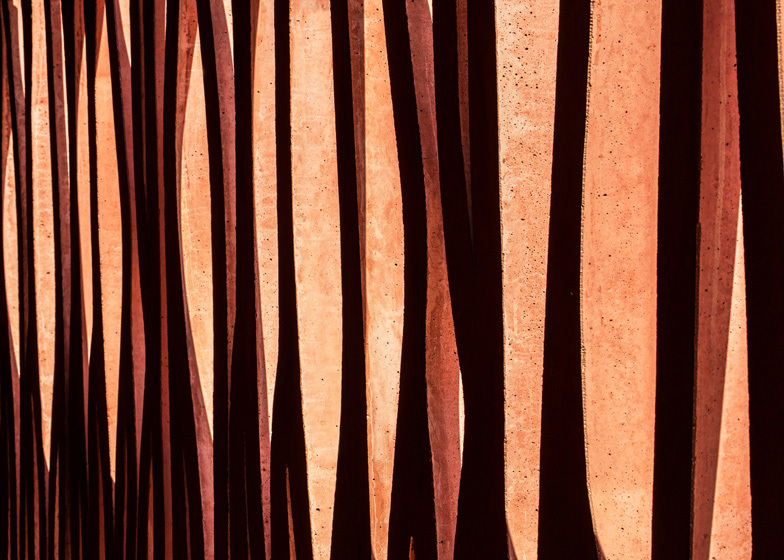 We developed the facades using a limited amount of distinct shapes, called strands, that were casted on site. These strands were then assembled in modules according to a simple mathematical algorithm which creates a vibration in the shadows and the matter. The restaurant is on the second floor. Its presence is highlighted by a large breach in the coral mesh, a window inviting the landscaping inside, and offering a panoramic view of the horizon and the open sea. The colourful concrete mesh is at the same time a balustrade and a visual filter to the sea. 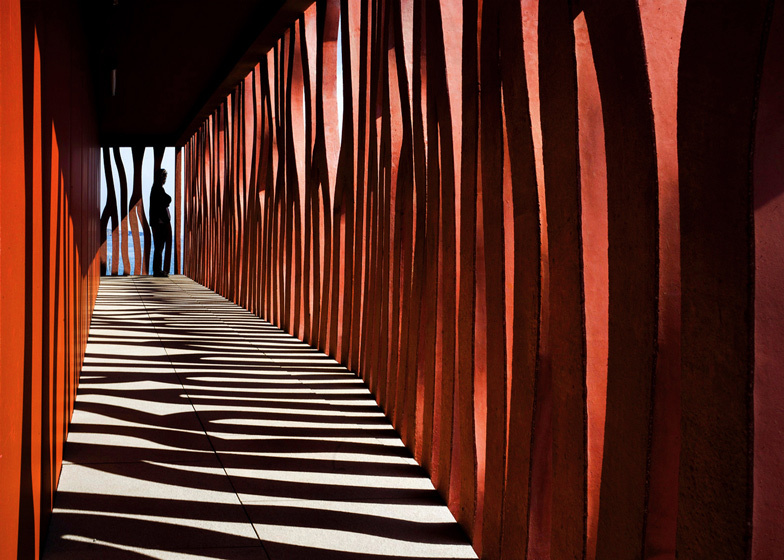 It provides a wall that guarantees the intimacy of users, bedrooms and walkways. It also features openings which offer a subtle variation to the framing of the near and far landscape. The gaze is attracted from the inside to the outside and reveals the landscape. The views become rhythmic, accentuated by the movements and the different uses. 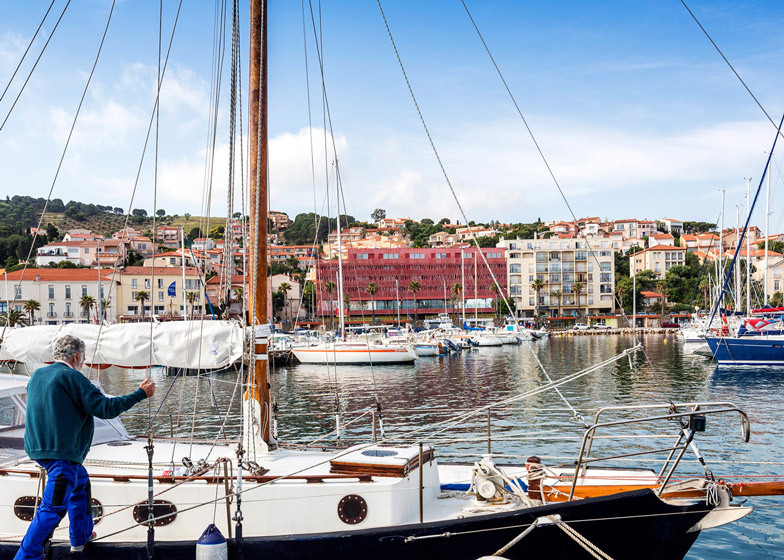 The international accommodation centre of Banyuls sur Mer draws its energy from the Mediterranean Sea. 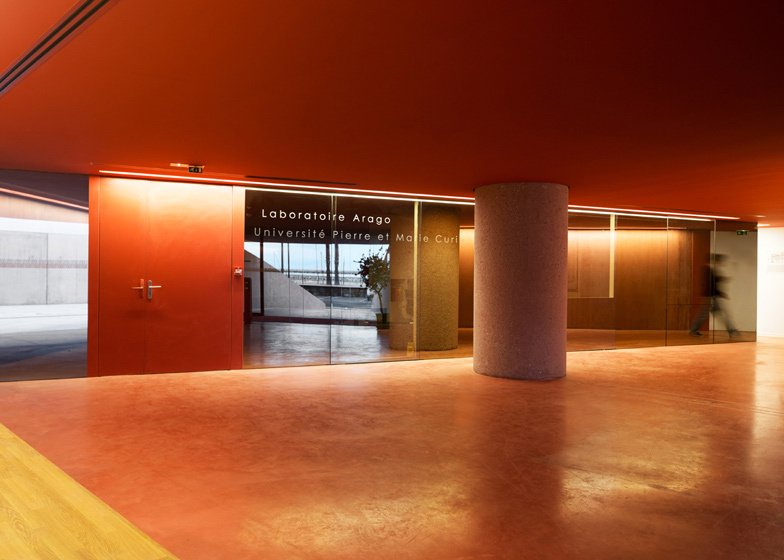 Beyond simple matter, the project falls within a poetic and scientific approach in order to reveal the landscape.